Shaving is an absolute chore, and waxing, for me is too painful. Opting for laser hair removal was one of the best decisions I've made. After just 2 sessions, there hasn't been much (if any) regrowth which means I can kiss shaving my underarms goodbye forever! I will still need a few more sessions to ensure that this lack of hair growth is permanent but I'm so happy with the results so far and it's shaved a couple minutes off my morning routine (pun intended). Following on from my initial consultation and first laser session, my second session wasn't when I should have had it. Ideally you're supposed to schedule your appointments every 6 weeks, which allows the technicians to be able to target the hair follicles right before a new cycle of hair comes in. When hair falls out, new hairs are supposed to grow. Due to the cycle of hair growth, it's essential that every cycle is targeted and zapped away! I, on the other hand was due to go back for my second appointment last year in July. However, I somehow caught H-Pilori (stomach infection) and was bed ridden for a week, meaning I had to postpone my session. Then, as per usual, life got in the way and I just never got round to rebooking, until March this year. Here's a little illustration on why you should ensure you go back within the 6 weeks advised. As you can see, once a hair falls out on its own, without ensuring the hair follicle is destroyed, a new hair will grow. As you can see, if you don't complete the treatment regularly, you risk having to start the treatment all over again as the new cycle of hair would just regenerate. One or two treatments are enough to thin the hair, for example if it grew too thickly or there was too much of it, but if you're after a more permanent solution to your hair problems and want it all gone completely, you definitely have to go back regularly and finish the treatment in full. 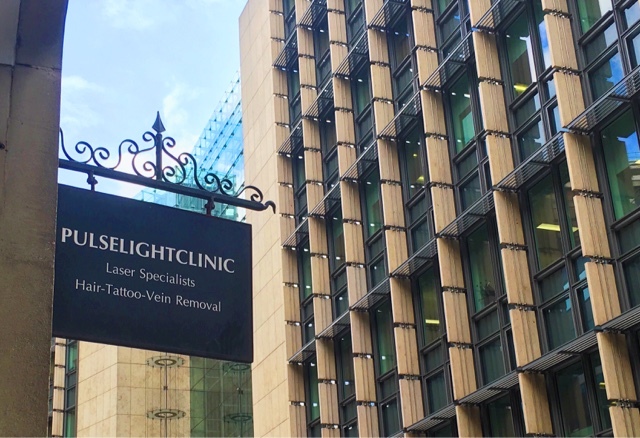 So I booked in to see them in mid April and went along to their clinic in Fenchurch Street, London. Upon arrival, I'm always greeted with a smile and the lovely technicians are so friendly and welcoming. As mentioned in my previous post, the actual treatment itself isn't that painful. It just feels like a hair is being plucked out, followed by the smell of burning. The more hair and the more dense your hair is, the longer it will take to make sure all hairs have been treated. The actual laser is super hot, but the machine also blows cold air on the same area so that you don't actually feel the heat. My underarms were a little sore afterwards as my top was quite tight and rubbed, so I used my Dr. Organic Aloe Vera gel and the pain soon vanished. Almost 6 weeks has passed since my 2nd treatment and am awaiting my appointment next week, I haven't even noticed any hair growth, especially not the thicker visible hair that grew before. I'm really looking forward to spending my summer holidays (11 days away!!!) without having to worry about lifting my arms up or wearing sleeveless tops and bikinis. And then, once I have finished this course of treatments, I can enjoy that feeling for the rest of my life! I'm actually really tempted to get my legs and bikini line done, and then maybe my upper lip and brows.. There are endless possibilities with permanent hair removal. It's just a great way to make your life easier and save time! In my next post of this series, I will be exploring the difference between IPL and Laser hair removal. So keep an eye out! If you're interested in getting a treatment like this, give Pulse Light Clinic a call and book your initial consultation. They also offer skin treatments for acne, scars, tattoos and more! Have you had hair removal treatment? Has it lasted?